These past couple of days have been a whirlwind of work (not so much of activity). I’ve spent most of my time sequestered in a hotel, writing papers and reports. Hey, I’m not on vacation here! Had a wonderful lunch with a new colleague at the Centre for Development Studies yesterday. The CDS is an attractive campus that teaches economics from a development standpoint; its architecture is economical, using building materials meant for low income housing— but done so artistically that it actually looks more expensive than traditional buildings! 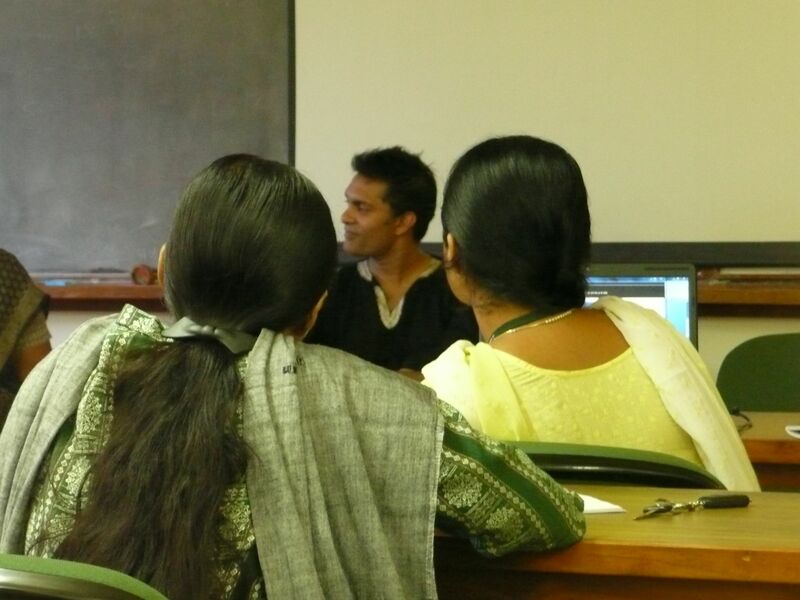 And today I gave a lecture at the Achuta Menon Centre for Health Sciences in Trivandrum’s medical college. It really was a lovely experience. First, I had a chance to meet with the students, most of whom are medical or nursing post-grads who are currently pursuing MPH degrees. I was quite impressed by the breadth and depth of their various dissertation topics… and a tad horrified that each of them is required to self-fund his or her research! This kind of work can get expensive very fast. I have strong memories of being (literally) a starving student, and I hate to see students pushed further into debt. This is not a criticism of the Indian system, but rather an expression of concern for all students around the world. The cost of education, worldwide, is much too high. The actual lecture was held in a different classroom (an advanced and large seminar room), with students and professionals from across the city invited to attend. It was actually quite packed. And, as usual, I was only vaguely prepared. See, I have a policy against over-preparing for presentations. As is my tradition, an hour before the talk, I wrote a few notes down on a bit of paper over lunch. That would be my outline. I find an audience enjoys the spontaneity of a reflective speaker who contemplates in the moment. This confused me for a while… until I found out that those students have been reading this blog. Ahhh. Now I’m embarrassed. So, to those MPH students still reading today: thank you for attending my talk, and try not to be too shocked by some of the nonsense I write in this space, okay? I may have a lot of degrees, but at heart I’m just an idiot with a big vocabulary. Now, our original plan was to head to Rajasthan in the morning, for my final day in India. Hey, I deserve one day of pure tourism, right? When I expressed this intent to one of the students, she claimed that she had always wanted to go to Rajashtan. So I immediately took her photo and promised to digitally add her to the scenes that we would be visiting. Unbeknownst to her, our plans had to change. The flights are just not working out. A back-up plan to drive to Madurai also fell through, as did an unpopular plan to spend the last day in Chennai. Instead, we are spending our final day in Delhi, before Adam flies off to Toronto and I to Beijing (don’t ask).